The Vigor 2862Ln features the same specification as the standard Vigor2862 product with the addition of built-in 4G (Cellular/LTE) connectivity, compatible with all UK/Ireland cellular networks (apart from 'Relish'). The series includes the Vigor 2862Ln as the main product but a version without wireless LAN is also available to order for special project requirements. As well as connectivity to the 4G (LTE) networks, the Vigor 2862L series provides backward compatibility to 3G networks for areas or networks where 4G isn't available. Full function MS message operation also provides additional functionality and control (see later). Secondary or backup 3G/4G connectivity, using a second network/SIM can be added by the use of an additional 3G/4G USB modem (not supplied). 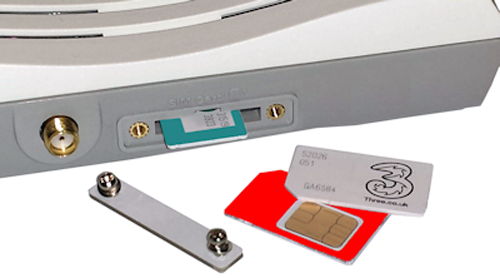 Note that an external USB modem is only needed for the second cellular connection - the primary 3G/4G interface and SIM slot is built-in. 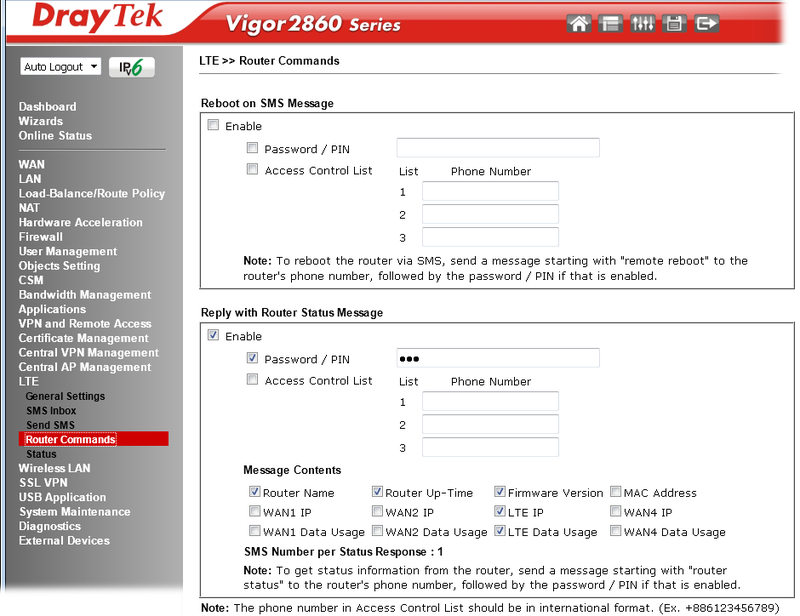 Alternatively, using Wireless WAN, the Vigor 2862L can derive a secondary WAN (Internet) connection from a WiFi feed - e.g. your mobile phone's hotspot or a temporary mobile provision. Note that the 'Vigor 2862L' series consists of two model variants. The built-in cellular features are the same on each, but they have either no built-in WiFi (Vigor 2862L) or 802.11n WiFi (Vigor 2862Ln). All other features are the same. The non-wireless model (Vigor 2862L) is available only to special order for project application. 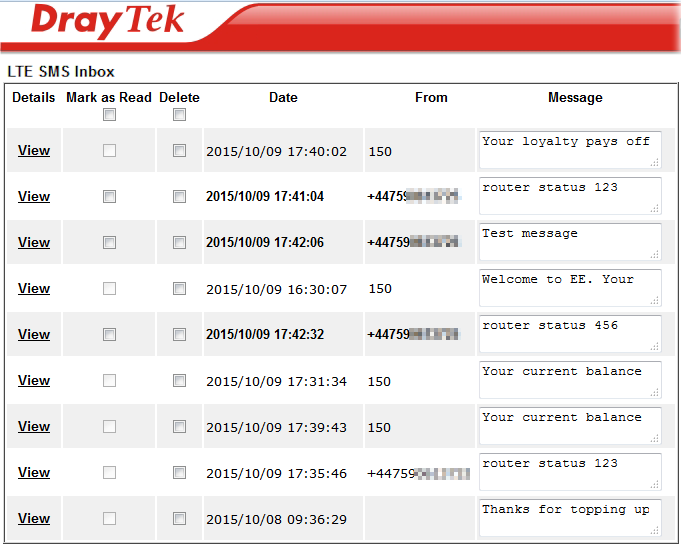 Wireless LAN can be disabled on the wireless models or can be ordered factory disabled. 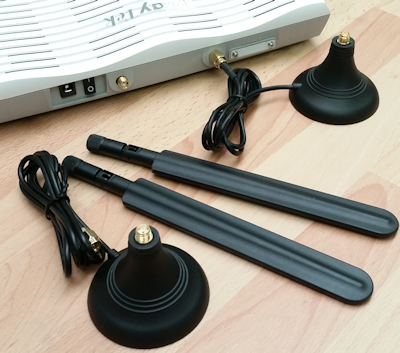 The Vigor 2862Ln ships with two LTE aerials (antennae) which can rotate and tilt for optimum reception. The included extension bases provide a 1M extension cable to allow optimum positioning, avoiding obstructions, cabinets or equipment. On the wireless LAN-equipped model (Vigor 2862Ln), there are two additional aerials. The WiFi (outer two, white) and LTE aerials (inner two, black) have different plugs to ensure that that the correct socket is used. Important Note: Please refer to the main Vigor 2862 product page for more details of standard features included in the range. The specification and compatibility listed here applies only to the UK model for use in the UK & Ireland - product code V2862L-K (without WiFi) or V2862LN-K (with WiFi). For use in other regions, you should ensure that you are buying the model intended for that country and its cellular networks. When purchasing your unit, ensure it matches your region (the outer box is clearly labelled) in order that it has the correct regional network support and compatibility. As a cellular network device, the Vigor 2862L takes advantage of text messaging (SMS) to allow remote interrogation and control. 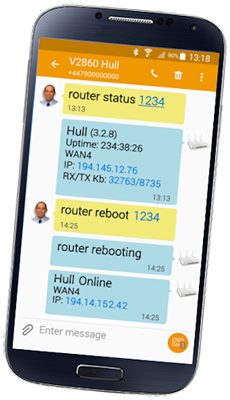 Sending a simple command ('router status') to the router from a regular cellphone will get an instant reply telling you about the router's current status, firmware version, each WAN port's IP address, status and data volumes. Another command ('router reboot') enables you to reboot the router remotely. For security, the commands require a password and a whitelist can allow messages only from your specified phones preventing unauthorised persons from being able to send rogue commands. See the screenshot on the right for examples. 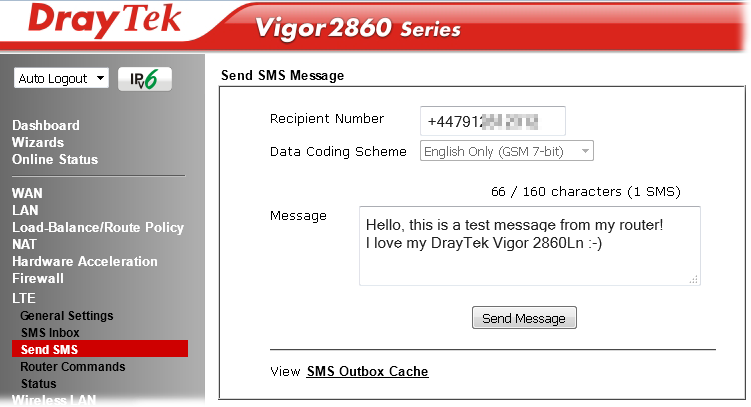 The Vigor 2862Ln can also send and receive text messages from its web interface; checking incoming messages allows you to read service messages, for example that you are low on credit but it's also a quick way to type a message to anyone else's mobile phone from your web browser. The facility is also useful to confirm your credit balance (for PAYG SIMs) or to use top-up vouchers (where these are accepted by SMS). You can also send text messages from the command line via a telnet connection - more suited for automation/integration. 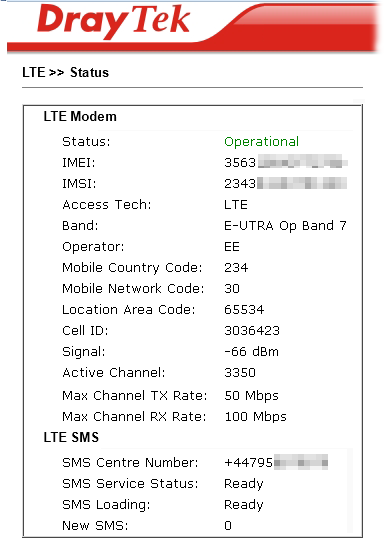 Above: Configuration of SMS/Text Remote Interrogation - Whitelist and password protected.